Imagine a trek amidst the lush green meadows, steep mountains, and rough cliffs. Trekking is not for everybody’s task. It is not for the lighthearted ones. Trekking basically tests one’s mental toughness and physical fitness. A Himalayan Trek is obviously on the ‘To-Do’ List of many adventure seekers and trekkers. Well, this is called for because of Nature’s grandeur and opulence, the breathtaking view of the sky above, the serenity of the valleys. In 1953, Sir Edmund Hillary and Sherpa Tenzing Norgay conquered the world’s highest mountain. Since then, many mountaineers and trekkers have made several attempts to scale the world’s tallest peak. Mount Everest stands at a formidable height of 8,848 m above sea level. It is one of the most attempted peaks by the mountaineers and trekkers. Although, the peaks remain hidden from view during the trek to the base camp, but its triangular top piercing through the clouds can often be seen and makes one feel small as an ant in front of Nature. Before one goes to conquer the daunting summits of Mount Everest, trekking to the Everest Base Camp forms an essential part of the journey. In fact trekking to the base camp is a sort of challenging adventure itself. Also a wonderful experience, as it offers a glimpse of the breathtaking scenery of the Himalayas. The glory of walking on the same trails treaded by the legendary mountaineers can be very exciting. Passing amidst the beautiful Everest High Passes, rich flora and fauna, giant firs, Rhodendron forests, turbulent river, and serene valley accompanied with the marvelous view of the Himalayas. Many people prefer to fly down to Lukla in order to start their trek to the base camp of Everest. The classic Everest Base Camp Trek starts from Upper Phakding. Trekkers will need to follow the Dudh Kohi Valley and climb up the bustling Namche Bazar. From here, the real trek starts. Basically, it’s a high altitude trek with many vantage points for having a beautiful view of the Everest. After crossing the monasteries, the trek requires a steep descends to ImjaKhola via the villages of Pheriche and Pangboche. Finally, it reaches the Khumbu Glacier after a few hours. After that one needs to follow the paths of the glacier that will land one at the foot of the Lobuche peak. After an overnight halt, the last stop for before reaching the Everest Base Camp Trek is the Gorok Shep. 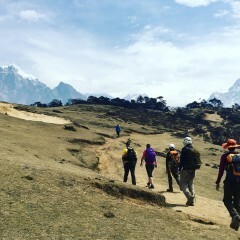 Trekkers should always remember that the best time to enjoy the Everest Base Camp Trek is during late September to early November and March to April. Not because of the pleasant climatic conditions, but also for the abundance of flora and fauna that will make the trek enjoyable. One thing which every trekker should remember is that they should be mentally prepared for the physically challenging trek in advance with the right trekking gears and equipment.